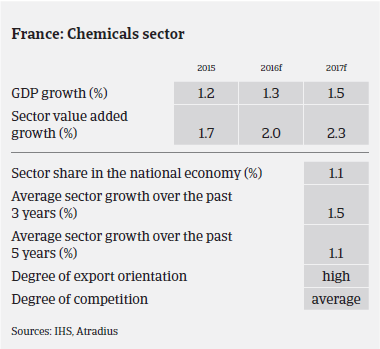 The French chemicals sector has proved to be resilient in recent years, despite subdued growth rates of the French economy. According to the French chemicals association UIC, French chemicals production grew 0.9% in 2015 after a 2.8% increase in 2014. As a strategic export industry, the French chemicals sector generated a trade surplus of EUR 7.3 billion in 2015. An increase of 5.6% in imports indicates that French chemicals production lost domestic market share in 2015. In 2016, production growth of 1% is expected, supported by increased investments, low oil and natural gas prices, a benign EUR/USD exchange rate, and low interest rates. However, the more subdued global growth outlook acts as a break on additional expansion. Looking at subsectors, mineral chemicals and soap and perfumes are forecast to increase 1.0% in 2016. Organic chemicals, one of the most important segments of the French chemicals industry, contracted 1.6% in 2015, but is expected to grow 0.5% in 2016. Specialty chemicals are expected to increase 1.5% in 2016 after growing 9.9% in 2015. The good performance of this segment is due to increased demand for paints, essential oils and lubricants. Given that the chemicals sector´s export share (mainly in Europe) amounts to more than two thirds of overall sales, French businesses are in strong competition with international players, especially with US chemicals businesses that benefit from lower energy prices. 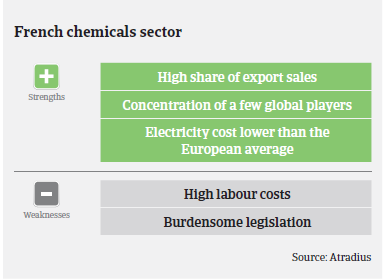 Other issues for the French chemicals industry are high labour costs and stricter regulation than in most other countries. That said, the industry has benefitted from comparatively low electricity prices and the lower exchange rate of the euro against the US dollar. Moreover, French chemicals production is concentrated around a few large international players who have wide access to financing and diversified markets. Thanks to lower input costs and economic stimulus initiated by the French government, the chemicals industry improved its profit margins in 2015. According to the economic research institute Xerfi, EBITDA margins increased from 7.6% in 2014 to 8.4% in 2015. The danger of losing competitiveness has clearly led to some strategic restructuring measures by French chemicals businesses, such as focusing on core business activities and diversification of activities into specific segments with higher margins (paint, ink, glue, herbal-pharmaceutical products, essential oils). In order to improve their margins, smaller companies continue to focus on niche markets, investing in research and development and on developing additional services for technical support of customers. The volume of protracted payments and non-payments is expected to remain low. The industry is characterised by a low level of insolvencies. It is expected that the number of insolvencies will decrease further in 2016. However, given the value chain structure of the sector, insolvency of a major player would have a severe impact on suppliers. 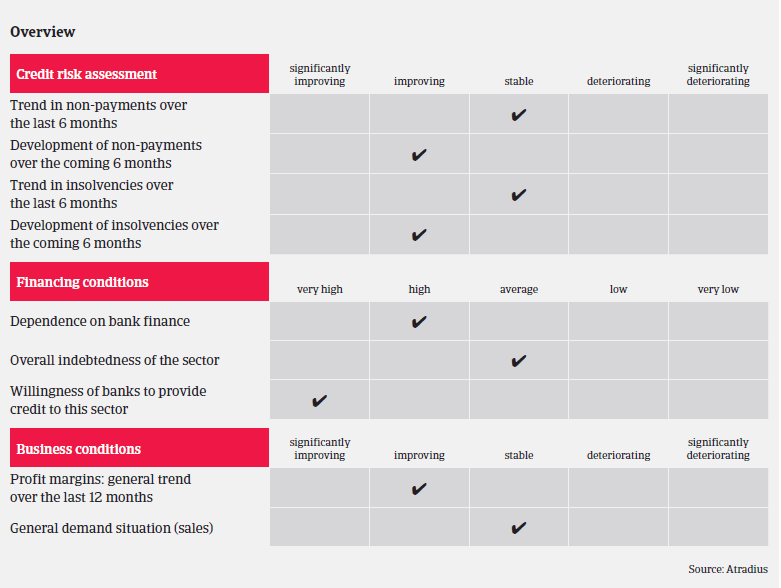 Due to the overall good performance and the low frequency and value of credit insurance claims, our underwriting approach is positive across all subsectors. When underwriting chemicals businesses, it is also important to identify end-markets (for instance the French construction sector as one of the major chemicals buyer industries still shows no comprehensive rebound). Despite overall growth, many French ICT companies face structurally low margins, price pressure and an on-going consolidation process in the market.